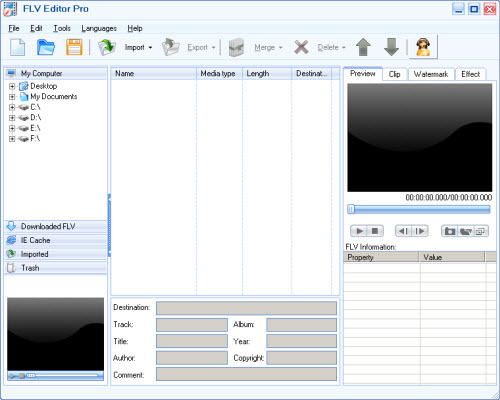 FLV Editor Pro provides numerous editing functions. You can joint several FLV files together and output them into one recoded file or FLV without recoding. Crop and trim the video to get the wanted video size and length. Moreover, adding special effects makes your video different such as BlackAndWhite, Emboss, Purple, and so on. With the useful watermark function, you are able to add logos and subtitles to the video. Best protect and personalize your video. If you like the still pictures during the video, you can capture them or output image sequence to select a best one. Qweas is providing links to FLV Editor Pro 3.1.13.0 as a courtesy, and makes no representations regarding FLV Editor Pro or any other applications or any information related thereto. Any questions, complaints or claims regarding this application FLV Editor Pro 3.1.13.0 must be directed to the appropriate software vendor. You may click the publisher link of FLV Editor Pro on the top of this page to get more details about the vendor.